A conventional computer mouse (e.g. ball, optical, or laser) requires a flat surface to operate. This is inconvenient when using the computer on a lap, bed, or crowded desk. 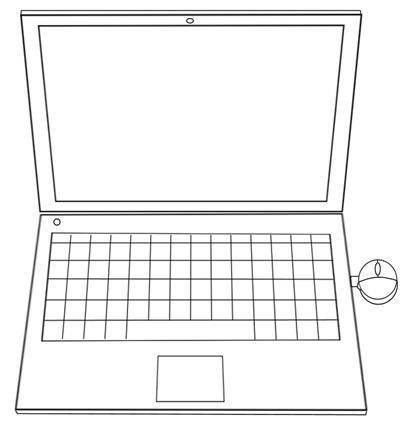 Laptops eliminate the need for a flat surface by implementing a touchpad or pointing stick (e.g. IBM TrackPoint). These devices are controlled by one finger and lack the accuracy and precision of a conventional computer mouse. I claim that a pointing stick is inaccurate because it is controlled by just the tip of one finger. Greater accuracy can be achieved if the pointing stick was the size of a conventional computer mouse, thus pushed by many fingers. My invention is an isometric joystick with the shape and size of a conventional computer mouse for the purpose of control from many digits. In other words, it is a conventional mouse with capacitive or resistive strain gauges instead of an optical tracker. 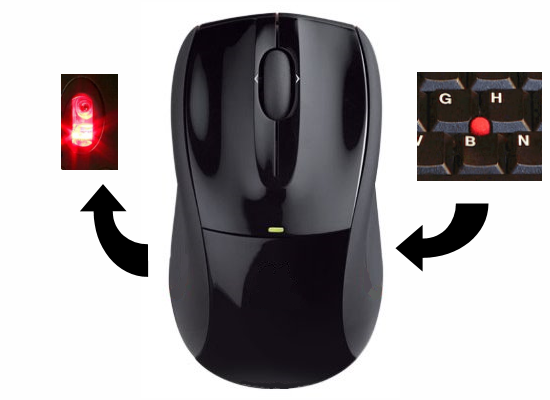 The device can have all the buttons of a conventional computer mouse (e.g. thumb, left, right, and scroll wheel). The position of the device remains constant, thus it does not require a large flat surface to operate. The device has a body, which is held by the hand, and a base, which is attached to something stable. Between these parts is the rod of the strain gauge to measure the amount of applied force. This information is sent to a computer to control the velocity of a graphical pointer via USB or wireless. Beyond graphical pointers, it can also be used to control velocity in other electronics. Shown above is the most preferred embodiment of my invention. 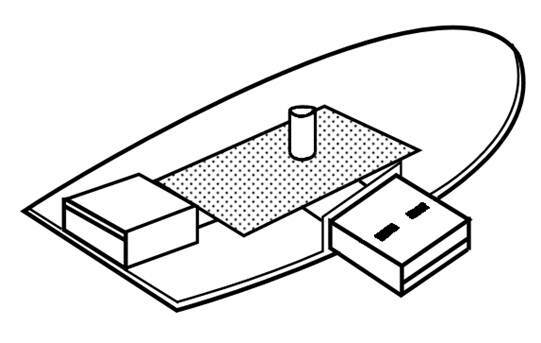 The device directly connects to the USB port of a laptop. For stability, a firm attachment must be made between the base of the device and the laptop. This can be accomplished by a wider-than-standard USB plug, a wedge inside a USB plug that the user slides, or an adjustable spanner that clamps onto the laptop. In a second embodiment, the device remains stable on any flat surface using a rubberized base. This embodiment communicates with the computer via wire or wireless. Unlike a regular mouse, it does not need much desk space to operate, and even works on the palm rest of a laptop. Shown above is the base of the device. Not shown is the body which attaches to the base at the rod of the isometric joystick in the center. All pressure applied from the fingers on the body converges at the rod. The dotted rectangle represents the circuit board for the strain gauges. 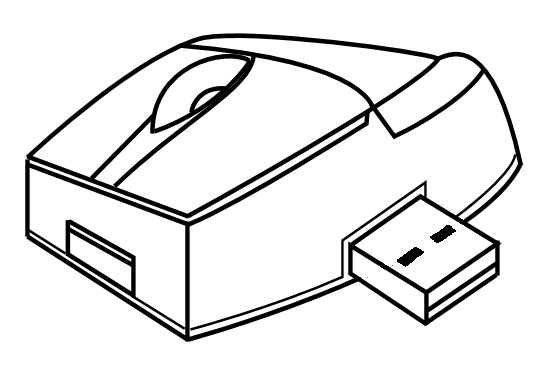 An optional USB port is shown for an additional USB device. The entire bottom of this base is rubberized to grip onto any flat surface. The base may be smaller than shown, and the isometric joystick may not be located in the center as shown. The invention is a mouse that senses pressure instead of movement. Aside from the buttons, the mouse does not move at all, which makes it different than a regular joystick. On a regular joystick (e.g. analog stick of console controllers), if you wanted to move a cursor left and then right, the joystick would have to be pushed from the center position to the left, and then back to the center, then to the right.